Almond brittle french toast, jalapeño short rib, parmesan veal -- with MGM Resorts having at least a hundred restaurants between all their Las Vegas properties spanning every cuisine you can think of, figuring out what to get for dinner would give even the most outspoken foodie on your Instagram feed choice paralysis. To help you out, not only did we break down what’s on the menu at all these different restaurants, but we picked the brains of MGM Resort’s head kitchen honchos so you order the best items across the (cutting) board. Here classic French comfort dishes run the gamut from escargot with chartreuse garlic butter in puff pastry to a variety of suitably pungent Parisian cheeses. 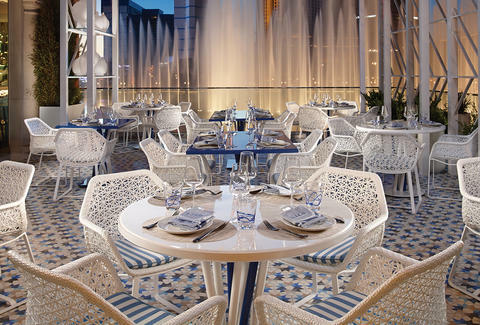 Besides their dinner fare, Bardot is really the place for brunch after a night of Vegas-worthy shenanigans. 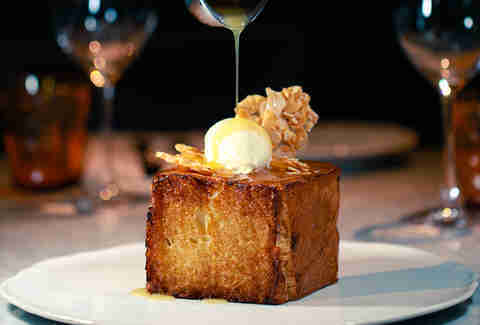 Dish: The french toast -- it’s almost a pound of brioche, with vanilla mascarpone and almond brittle. There are three of the world’s finest cuts of meat offered at Jean Georges Steakhouse: USDA Prime, Ranger’s Valley Australian Beef, and A5 Certified Kobe Beef -- one of the most coveted cuts of beef around. You can pair those with classic steakhouse sides or order up one of the seafood dishes, like diver scallops. 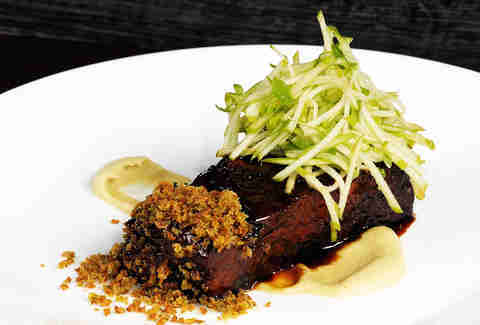 Dish: While the steak takes center stage, the short rib with granny smith apple and jalapeño was considered the best “fall” dish in Vegas this year by Vegas Seven. Sean Griffin, Executive Chef: "The rib is braised with soy, ginger, and star anise until very tender, then it's lacquered with its braising juices." Carbone is themed around classic Italian restaurants of the mid-twentieth century, so think rigatoni and vodka sauce, Chicken Scarpiello, and everything else you’d want to pronounce with a too-thick Italian accent and dramatic hand gestures. It helps that the decor feels like you’re stepping into a black and white mob movie. 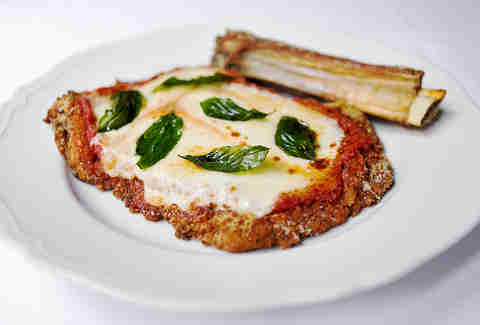 Dish: The veal parm features mozzarella that’s homemade in-house daily, as well as tomatoes sourced from Jersey that are so good, Carbone ships pallets of them to their Hong Kong location, too. Jonah Resnick, Executive Chef: “We started with the best veal we could find, then thought about all the components that go into the dish... Each of these elements elevate a simple dish to a new level, and combined create a version that is the most delicious we have eaten." Sage is the brainchild of James Beard award-winning chef Shawn McClain, and the menu is constantly in flux thanks to Mother Nature, the restaurant’s unofficial sous chef. Seasonal farm-to-table ingredients are the menu’s highlight, so right now it’s roasted heirloom carrots, a spice crusted venison loin, and hazelnut espresso mousse for dessert. Dish: The scallops are served with braised oxtail, trumpet mushrooms, and topped with a caramel reduction. Christopher Heisinger, Executive Chef: "The scallop and oxtail is Sage's answer to the surf and turf without it being too straightforward. 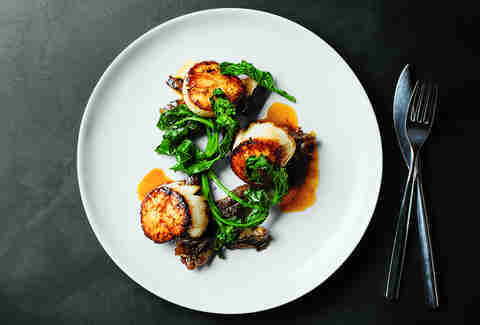 It is a nice mixture of sweet seared scallops and rich, earthy braised oxtail accompanied by a salted caramel reduction." This Tom Colicchio spot serves up antibiotic-free steaks on an open flame, in a kitchen that is also open to the dining room -- so you’ll be able to see your whole meal cook up in perfectly medium rare, beef-y glory. After, the dessert menu features an entire ice cream selection that’s anything but vanilla (but sure, you can get vanilla if you really want it). Dish: The classic prime rib with Yorkshire pudding and au jus. But don’t fear if this was your meat-loving friend’s pick, as the seafood is top notch. Morimoto (as in THE Iron Chef Masaharu Morimoto) is a blend of Western and Japanese influences, so the caesar salad is topped with seared tuna, and so is your pizza -- if you want. Besides being tasty, the dishes also look like they were made to be ‘grammed before you take a bite. 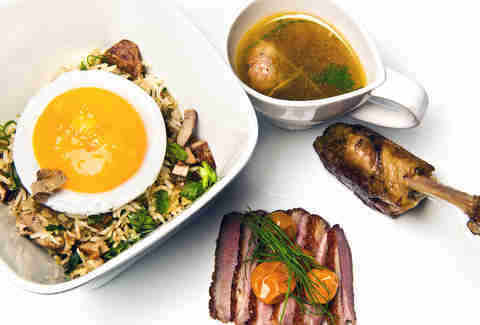 Dish: The Duck Duck Goose features a duck meatball soup, duck confit fried rice, and gooseberry compote, so we’re guessing you won’t run in a circle after. This Michelin-starred French restaurant is designed to look like an art deco townhouse, with marble floors and a garden terrace -- and the food is just as luxe. The tasting menu covers everything from caviar to black truffle tarts, so make sure you keep your shirt tucked in and your elbows off the table. 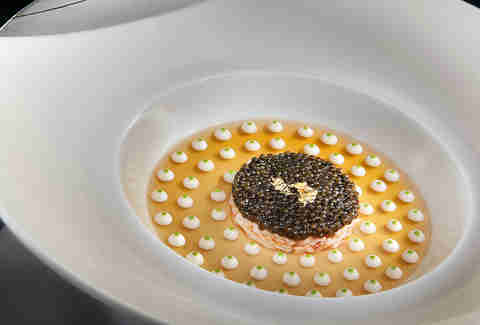 Dish: Go for Le Caviar -- Alaskan king crab topped with osetra caviar, encircled with crustacean gelee, then dotted with cauliflower. L’Atelier is the (slightly) more casual version of Chef Joël Robuchon’s two restaurants at the MGM Grand. At L’Atelier, the dining experience is kitchen-side and interactive, but still feels high-end. So you can get the steak, while your friend gets the burger. 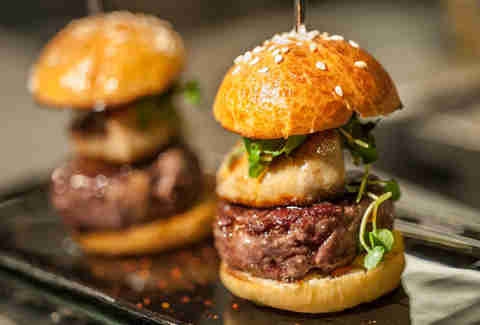 Dish: For something more casual, (but still plenty fancy) Le Burger is made with beef and foie gras, then topped with caramelized bell peppers. Pablo Picasso’s favorite haunts, Spain and France, shape the menu here -- if you can tear yours eyes off Picasso’s original paintings on the walls to read it. Dish: The Warm Quail Salad features a whole pan roasted quail, along with crispy artichokes, frisse salad, and topped with truffle vinaigrette. So it’s a salad that eats like an entree. Chef Jean-Georges Vongerichten’s last name may be hard to pronounce, but “dry-aged bone-in rib eye” is not. 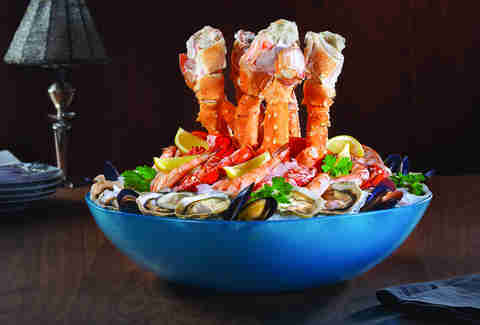 Dish: In addition to the red meat options, the chilled shellfish platter features almost an entire fish market’s worth of seafood, (including half a 1.5-pound lobster) and is served with a red wine mignonette, a mustard mayo with Sriracha, and classic cocktail sauce. 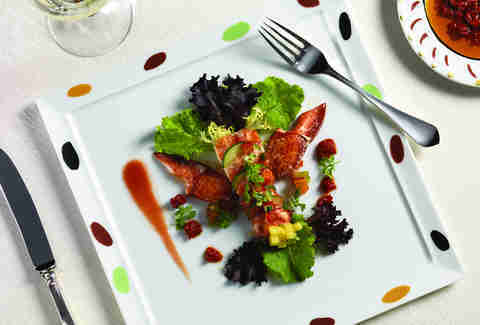 Dish: The Lobster Carpaccio. The lobster is sliced thin, then paired with shaved sweet onion, cilantro, and ponzu sauce. 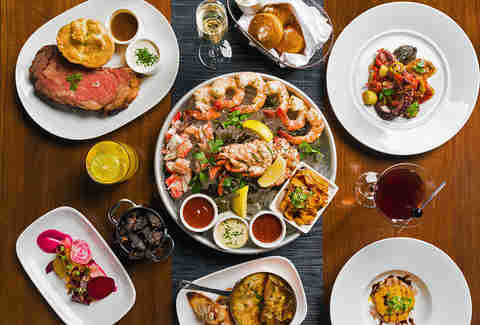 Mandalay Bay’s first gastropub serves up everything from shareable small plates and appetizers to full-on entrees, alongside an extensive craft cocktail menu. 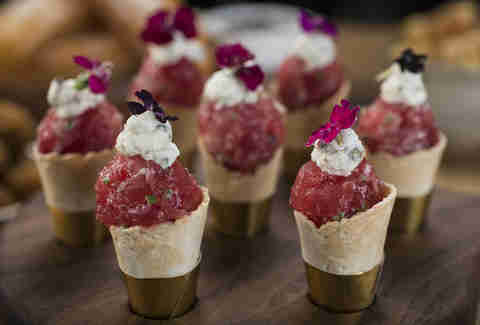 Dish: The ahi tuna tartare, served with Asian pear, toasted pine nuts, ancho chili, and sesame oil. It won’t weigh you down before you head out to fun. Sure, there are steaks at Chef Michael Mina’s STRIPSTEAK (and slow poached steaks in butter, at that) -- but instead of bread to snack on, they give you duckfat fries. Yes, you read that right. Dish: Start your steak dinner off with the “Instant Bacon” -- it’s a five-spice pork belly served with a tempura oyster of green cabbage slaw.